Block paving is a very popular choice for driveways, patios and pathways all over the world, thanks to its versatility, the variety of designs available and the durability of the paving slabs themselves. However, like most surfaces, block paving can fall victim to stains and marks, which can damage the clean and consistent appearance of the surface. 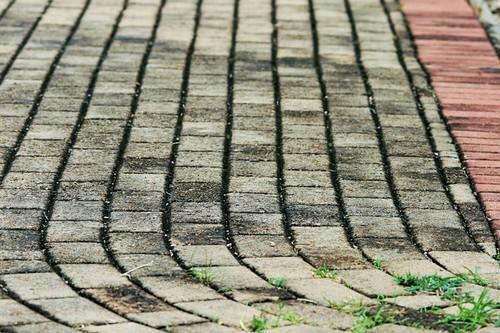 In this article, we will look at the most effective ways to remove these stains from your block paving, helping to restore your driveway or patio to its former glory. If you have rust stains on your patio, then there is a specific set of steps you need to follow in order to remove them successfully. Firstly, identify where the rust is coming from and remove whatever is causing it. It could be a car on a driveway, a bike left on the patio or even something like a metal bucket. Wet the affected area, then use a 10% hydrochloric acid solution to remove the stain. These products are available from homeware stores and builders merchants. Take care to follow the manufacturer’s instructions as improper use of the hydrochloric solution can damage your patio. As oil soaks into paving it can be quite tricky to remove. However, if you act quickly when such a spillage occurs, you can prevent staining by using absorbent materials like paper towels or a cloth. Take care to soak up the oil rather than rubbing it, as that will just spread it around. If the stain is more stubborn than anticipated, use a strong detergent to scrub the stain and then hot water to wash the solution away. Take care while doing this to avoid altering the pigment of the concrete. For the most difficult of stains, use an emulsifying degreaser. Brush it onto the affected area, leave for a certain amount of time (specified in manufacturer’s guide) and then use clean water to wash it away. If the paint is freshly split, then use a paper towel or cloth to absorb the paint, rather than wiping it. Using a solvent that is suitable for the application, scrub the stain and then wash away the solution with clean water and detergent. For dried paint, try and scrape off as much of the paint as possible. For any remaining paint, use paint remover before thoroughly washing the surface. A common issue for driveways, tyre marks can often be removed by weather over time, but this is not always the case. Using hot water and detergent, scrub the marks until they disappear and then wash away the leftover solution. Alternatively, use a power washer to remove the marks. By following the above steps for the appropriate types of marks, you will see your block paving restored to top condition in no time. If you feel you need a block paving surface on your property, or you want to freshen up your existing one, then get in touch with UK Surfacings Ltd and we’ll be more than happy to help.